Box Text: Let's Get Cookin', Mama! Now you can learn how to cook with your Nintendo DS! Prepare foods, combine raw ingredients, cook the meal and present it to Mama for your final score. Create 76 real dishes or combine recipes to create more advanced meals. Use the stylus as your master kitchen tool to chop, slice, pan fry, knead, grate, mash and more! Share recipes with up to 4 other people. Cool down hot food by blowing into the DS Microphone. 02-04-2018 aliensstudios Box Text Let's Get Cookin', Mama! 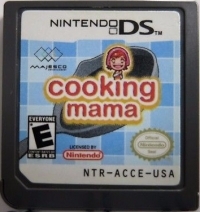 Now you can learn how to cook with your Nintendo DS! 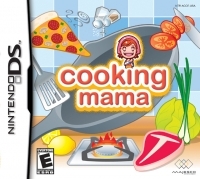 Prepare foods, combine raw ingredients, cook the meal and present it to Mama for your final score. Create 76 real dishes or combine recipes to create more advanced meals. Use the stylus as your master kitchen tool to chop, slice, pan fry, knead, grate, mash and more! Share recipes with up to 4 other people. Cool down hot food by blowing into the DS Microphone. 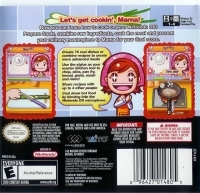 This is a list of VGCollect users who have Cooking Mama in their Collection. This is a list of VGCollect users who have Cooking Mama in their Sell List. This is a list of VGCollect users who have Cooking Mama in their Wish List.